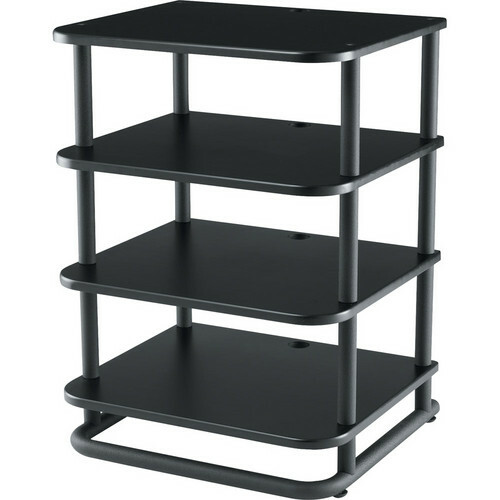 The Sanus Euro Series EFA31-B1 Modular Audio Rack in black features a fully customizable design that allows you to add or remove shelves to accommodate your placement needs. 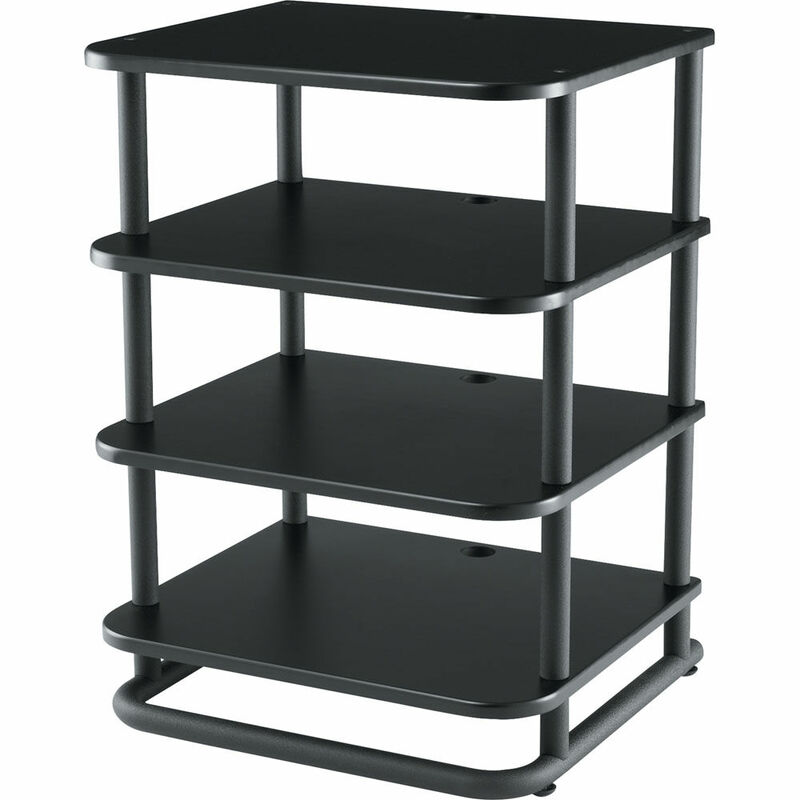 This rack comes in a hand-sanded black lacquered finish, and features an open architecture design that enables air to circulate around your A/V components. The included quick lock clips route wires in an organized manner for a neat and tidy appearance. Adjustable feet help keep the rack sturdy and stable on uneven surfaces. Box Dimensions (LxWxH) 23.9 x 21.4 x 5.6"
Euro Series EFA31-B1 Modular Audio Rack (Black) is rated 4.8 out of 5 by 8. Rated 4 out of 5 by Dalmatic from Solid and sturdy at a reasonable price Very nice audio rack and a good value. Assembles very easily, and feels very secure once it's put together. I especially like the modular design (for adding shelves later) and slightly narrower 22.5 width instead of the typical 26 or more (great for our limited floor space). The only problem I had was that it seemed impossible to avoid chipping the paint near the base during assembly, wherever there is direct metal-to-metal contact. I had to use a black marker to cover up the resulting blemishes. Otherwise, I'm quite happy with this purchase. Rated 5 out of 5 by E.E. from A Real Bargain! In a world of seriously over-priced, audiophile kit, it's really nice to find a product that works exactly as it should, and doesn't cost a fortune. This rack is sturdy, well-designed, and easy to put together.One can even add more shelves to it later - a great feature.I've noticed that the boutique audio catalogs have dropped the Sanus products, probably to go with competing racks that have a higher mark-up, but I'm glad B&H still has them! Rated 5 out of 5 by RJ the DJ from Would Buy Again and Again I own four of these and have never been more satisfied with my units. Easy to assemble only tool you need is included. Expandable. Only complaint is no casters available for this unit. The original casters are discontinued. Likely because they were not strong enough to support equipment weight. Rated 5 out of 5 by Anonymous from Best Audio Rack . Ever. Versatile and infinitely expandable. I have my JVC D-ILA RS 500 U on the top shelf. Rock steady and handles 80lbs per shelf. Wow. Easy on the wallet. Rated 5 out of 5 by Anonymous from I HAVE bought this item again This is the second Sanus Euro rack I have purchased. Great value. Goes together easily and is rock-solid. Comes with both adjustable feet or spikes. Rated 5 out of 5 by Anonymous from exactly what i wanted fits well in living room to hold pc and video game consoles + extra storage. looks great. Rated 4 out of 5 by Scott from Great Rack Was happy to see this arrived today, opened it up and assembled it pretty quick. Feels very solid and currently have the spikes in for the carpet. I am overall impressed with the build quality, there was a bit of machining work that seemed rough on the holes. Metal shavings that didnt come completely off but its being too harsh. The finish isnt bad, its a textured coating on the metal bits. Rated 5 out of 5 by Benjamin from Solid audio rack This is my second one, great all around. Can be easily filled with steel shot to add stability weight.